VISIONQWEST MEETING WITH PACQUIAO TODAY TO ADDRESS "ALL OPEN ISSUES"
Earlier today, FightHype.com recieved word from a reliable source that Michael Koncz, on behalf of Hall of Fame promoter Bob Arum, traveled to the Philippines with a letter hoping that pound-for-pound champion Manny Pacquiao would terminate the services of VisionQwest Resource Group, the company he hired to handle his accounting. Charged with the task of reviewing all of Pacquiao's business contracts dating back to 2005, a representative of VisionQwest contacted the Nevada State Athletic Commission in an attempt to gather more information regarding the eight-division world champion's bout agreements. Evidently, the move did not sit too well with Arum, who immediately took action by having Koncz return to the Philippines. FightHype.com has just learned, however, that representatives of VisionQwest will be meeting with Pacquiao today to reveal some "open issues" they found from the research they've conducted thus far. "VisionQwest has arrived in Makati, Philippines and will meet with Manny to address all open issues," revealed Michael Lodge, President & CEO of VisionQwest Resource Group, via email moments ago. It's unclear as to exactly what those "open issues" are, but it's obvious that something has been discovered which has prompted both Arum and VisionQwest to take action. What caused Arum to instruct Michael Koncz to fly back to the Philippines after having just returned two weeks ago? 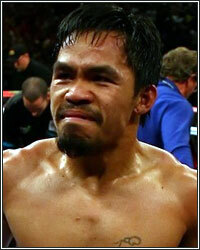 Has VisionQwest found some discrepancies in Pacquiao's accounting? Stay tuned as this story continues to develop.